Chinese calligraphy, literally ‘beautiful writing’, is an ancient art-form which harks from a time when the way you wrote was just as important as what you wrote. Celebrate Lunar New Year and the Year of the Pig with master calligraphers from the Australian Oriental Calligraphy Society. Traditional New Year greetings wish wealth and prosperity. 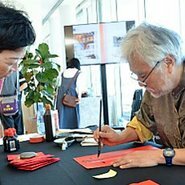 Artists from the Australian Oriental Calligraphy Society will be taking requests to create handwritten auspicious phrases for you to take home so that you can start the new year with good luck.